Young Guns II is a 1990 American western film and a sequel to Young Guns (1988). It stars Emilio Estevez, Kiefer Sutherland, Lou Diamond Phillips, Christian Slater, and features William Petersen as Pat Garrett. It was written and produced by John Fusco and directed by Geoff Murphy. It follows the life of Billy the Kid (played by Emilio Estevez), in the years following the Lincoln County War in which Billy was part of "The Regulators" – a group of around six highly skilled gunmen avenging the death of John Tunstall – and the years leading up to Billy's documented death. The film, however, is told by Brushy Bill Roberts, a man who in the 1940s appeared claiming to be the real Billy the Kid. While the film takes some creative license, it does show some of the main events leading up to Billy's documented death, including his talks with Governor Lew Wallace, his capture by friend-turned-foe Pat Garrett, his trial and his subsequent escape in which he killed two deputies. In 1950, attorney Charles Phalen is contacted by an elderly man named "Brushy Bill" Roberts. Brushy Bill tells Phalen that he is dying and wants to receive a pardon that he was promised 70 years before by the Governor of New Mexico, claiming that he is really William H. Bonney aka "Billy The Kid", whom "everyone" knows to have been shot and killed by Pat Garrett in 1881. Phalen then asks if Bill has any proof that he is the famous outlaw. Brushy Bill's story begins with the remaining Regulators having gone their separate ways. Billy has become part of a new gang with "Arkansas" Dave Rudabaugh (Slater) and Pat Garrett (Petersen). The New Mexico governor has issued warrants for the arrests of those involved in the Lincoln County Wars, including Billy, Doc Scurlock (Sutherland), and Jose Chavez y Chavez (Phillips), who are dragged into town and imprisoned to await hanging. Meanwhile, Billy meets with the new governor Lew Wallace who agrees to pardon Billy if he testifies against the Dolan-Murphy faction. Billy soon finds out that he was tricked into being arrested with no chance of testifying against his old enemies. After escaping, Billy along with the help of Rudabaugh and Garrett, pose as a lynch mob to spring Doc and Chavez from jail. When the gang successfully escape Lincoln, Billy mentions the Mexican Blackbird (a broken trail only he and few others know that leads down to Mexico). Garrett decides not to go with the gang and, instead, open a boarding house. It is clear that Rudabaugh, in competition with Billy, wants to lead the gang. As they make a run for the border along with farmer Henry William French (Alan Ruck) and 14-year-old Tom O'Folliard (Balthazar Getty), cattle baron John Simpson Chisum (James Coburn) and Governor Wallace approach Garrett to offer him the job as Lincoln County Sheriff and $1000 to use whatever resources he needs to hunt Bonney down and kill him. Garrett agrees and, forming a posse, begins his pursuit of the gang. Chisum was approached by Billy earlier in the film, and Chisum refused to help. So, Billy steals some of his cows to get money they can use to get to Mexico. Billy and the gang soon come to the town of White Oaks where they meet up with former companion, Jane Greathouse (Jenny Wright) who runs a local bordello. Later that night, the town lynch mob comes for the gang and are intent on a hanging. Deputy Carlisle tries to negotiate a deal, "the Indian" (Chavez) for a safe rideout. Billy refuses the offer and pushes the Deputy out the door, who is then accidentally killed by the lynch mob. Garrett soon tracks Billy to the bordello, but is too late. In response to rebuffs by Jane, Garret uses his newfound power as Lincoln County Sheriff to declare her bordello a "house of sin," and burns it down. Jane decides to strip naked to humiliate the townsfolk and leave town. Meanwhile, Billy and his gang are continuously tracked by Garrett's posse, narrowly evading capture. But Tom (being mistaken for Billy) is soon shot dead by Garrett. As they hide out, Billy admits that the Mexican Blackbird doesn't exist; it was just a pawn to get the gang back together and to keep riding. Doc is angered and tries to leave for home, but he is shot by one of Garrett's men and sacrifices himself to enable his friends to escape an ambush. Billy the Kid is soon brought back into Lincoln by Garrett and is sentenced to death by hanging. He is then visited by Jane Greathouse, who arranges to leave a pistol in an outhouse. Billy uses the pistol to kill two guards and escapes to Old Fort Sumner. By the time he arrives, Dave has abandoned the group to make his way to Mexico, and Chavez is dying from a bullet wound he sustained during the ambush that killed Doc. During the night Garrett finds Billy unarmed. Billy asks Garrett to let him run to Mexico and tell the authorities that he killed him. Garrett declines because he believes Billy would not be able to resist coming back to the United States (which would lead to Garrett's death for lying). Billy turns around, forcing Garrett to have to shoot him in the back, which he does not. In the morning, a fake burial is staged for Billy and Garrett's horse is seen being taken by an unknown figure (implied to be Billy). Brushy Bill admits he never stole a horse from someone he didn't like, and further admits he didn't just like Garrett; he loved him. Phalen, convinced that Brushy Bill is Billy the Kid, agrees to help him. The epilogue reveals that Arkansas Dave was beheaded once he reached Mexico to discourage more outlaws from crossing the border; Garrett's book detailing his pursuit of Billy was a dismal failure and he is eventually shot and killed in 1908; Brushy Bill met with the Governor of New Mexico but despite corroboration from several surviving friends of The Kid, he was discredited and died less than a month later; whether or not Brushy Bill was Billy the Kid remains a mystery. The final shot shows Billy pointing his gun at an off screen target, saying to the target "I'll make you famous". Screenwriter-producer John Fusco culled much of Billy's dialogue from actual newspaper interviews and reports between 1879-1881. Fusco also appears as the "Branded Man" in the prison pit escape scene alongside Jon Bon Jovi. The cattle brand on Fusco's face reads J.C. for cattle rancher John Chisum. The film's original screenplay accurately portrays Scurlock as heading off to Texas with his bride. It has been reported that Kiefer Sutherland, faced with scheduling conflicts, refused to return to the Young Guns franchise unless his character died in the movie's "Stinking Springs Shoot Out". Writer John Fusco fought against this demand, but ultimately rewrote the scene to accommodate Sutherland's schedule. In the film, Billy the Kid and Pat Garrett share a joke together when Pat Garrett still in Billy the Kid's gang, Garrett calls Billy "Little Casino" when Billy calls Pat "Big Casino". John Chisum, played by James Coburn, in the film convinces Pat Garrett to accept a job as the new Lincoln County Sheriff. Coburn himself played Garrett in Sam Peckinpah's Pat Garrett and Billy the Kid (1973). Emilio Estevez originally approached Jon Bon Jovi to ask him for permission to include the song "Wanted Dead Or Alive" on the soundtrack. Bon Jovi didn't feel the songs lyrics were appropriate; however, he was inspired by the project and resolved to write a new song for the film that would be more in keeping with the period and setting. He quickly wrote the song "Blaze of Glory", and performed it on acoustic guitar in the Utah desert for Estevez and John Fusco. "Blaze of Glory" went on to reach No. 1 on the Billboard Hot 100. Jon Bon Jovi would go on to name his debut solo album Blaze of Glory (released as Young Guns II: Blaze Of Glory in the UK), which included the eponymous single as well as other songs from and inspired by the film. The album peaked at No. 3 on the Billboard 200 and No. 2 on the UK Albums Chart. Jon Bon Jovi also made a cameo appearance in the film, as one of the prisoners in the pit with Doc and Chavez (he can be seen 28 minutes and 8 seconds into the movie). The film's original score was composed and conducted by Alan Silvestri, who provided string arrangements for the song "Santa Fe" and has one brief track on Blaze Of Glory. On September 19, 2011 Intrada Records issued Silvestri's score on its own CD. Young Guns II opened on August 1, 1990 in the United States in 1,770 theaters, accumulating $8,017,438 over its opening weekend. It finished third for the weekend, behind Ghost (in its fourth week) and Presumed Innocent (in its second week). The film went on to gross $44,143,410 domestically. The film was also successful on video rental. Young Guns II received mixed reviews. On Rotten Tomatoes, the film has received a 35% approval rating based on 17 reviews (6 positive, 11 negative). 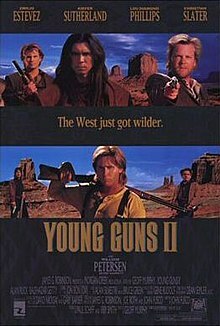 Roger Ebert, who gave Young Guns II 2 stars out of 4 stars, stated that "the screenplay feels unfinished, the direction is ambling, but the performances are interesting." Chris Hicks from Deseret News gave the film 2 out of 4 stars, stating Young Guns II was "sumptuously shot, very well-acted and full of potential." ^ "Allmusic (Jon Bon Jovi charts & awards) Billboard singles". ^ "Allmusic (Jon Bon Jovi charts & awards) Billboard albums". ^ "Chart stats - Jon Bon Jovi". Archived from the original on 2012-07-28. ^ "Weekend Box Office". The Los Angeles Times. 1990-08-07. Retrieved 2011-01-13. ^ "Young Guns II (1990)". Box Office Mojo. Retrieved 2007-05-05. ^ "VIDEO RENTALS : 'Young Guns' Not Firing Blanks". Los Angeles Times. Retrieved 2012-06-05. ^ "Review/Film;Emilio Estevez in Reprise of Billy the Kid Role". The New York Times. Retrieved 2012-06-05. ^ "Young Guns II". Entertainment Weekly. Retrieved 2012-06-05. ^ "MOVIE REVIEW : 'Young Guns II' Has the Fire but Lacks Depth". Los Angeles Times. Retrieved 2012-06-05. ^ "Young Guns II". Rotten Tomatoes. Retrieved 2007-05-05. ^ Ebert, Roger (1990-08-01). "Young Guns II". Chicago Sun-Times. Retrieved 2007-05-05. This page was last edited on 13 April 2019, at 22:34 (UTC).